Officials from Track Enterprises in Macon, IL have announced an unprecedented weekend of racing, camping, partying, and all out fun for Hornet competitors during the month of May. A Friday-Saturday doubleheader will feature $1,000 to win races at Lincoln Speedway and Macon Speedway, in Illinois. 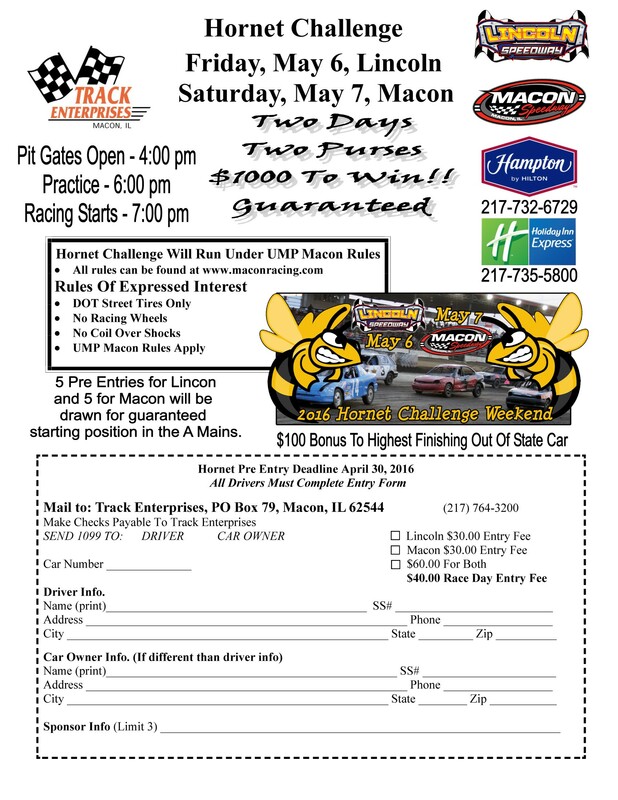 The events, scheduled for May 6 at Lincoln and May 7 at Macon, will pay $1,000 to win each night and $30 to start. Additional $100 bonuses are in place for the highest finishing out of state car each race, with competitors from all over expected to attend. The events will see heat races set up by draw, with passing points used to lock drivers into the feature field. A semi will be held to give remaining drivers a last chance to make the show. The Hornet class will be teched by Macon UMP rules which include street tires/wheels only and no coilovers. Pre-entry fee is $30 for each day or $40 if not received by Saturday, April 30. On Saturday, April 30, 5 Lincoln pre-entries and 5 Macon pre-entries will be pulled from a draw to give them guaranteed starting spots in that race. Those spots will only be used if the driver cannot make the show through the heats or last chance. Definitely some incentive to enter early. For more Lincoln information, follow Lincoln Speedway online at www.lincolnspeedwayil.com, on Facebook (www.facebook.com/LincolnILSpeedway), and Twitter (@LincolnILSpdwy). Updates are also available by calling the Track Enterprises office at 217-764-3200.